One of the things I’m contemplating studying when I grow up is Patristics, which is to say, the study of the Church Fathers, who are the church leaders, bishops, theologians, monks, writers, mystics, and whatnot, from the second through the fifth or sixth century, sometimes even later. As part of this, once Easter came and I was allowed to read books again, I read First Clement. First Clement is a letter from St. Clement, the third bishop of Rome, on behalf of the Romans to the Corinthians. I found it in an immensely useful book called Early Christian Fathers from the Library of Christian Classics. The book gives a good introduction to the writings of the period, as well as solid introductions to each work, editions of the text, and further reading. Let us note the remarkable token which comes from the East, from the neighborhood, that is, of Arabia. There is a bird which is called a phoenix. It is the only one of its kind and lives five hundred years. When the time for its departure and death draws near, it makes a burial nest for itself from frankincense, myrrh, and other spices; and when the time is up, it gets into it and dies. From its decaying flesh a worm is produced, which is nourished by the secretions of the dead creature and grows wings. When it is full-fledged, it takes up the burial nest containing the bones of its predecessor, and manages to carry them all the way from Arabia to the Egyptian city called Heliopolis. And in broad daylight, so that everyone can see, it lights at the altar of the sun and puts them down there, and so starts home again. The priests then look at their dated records and discover it has come after a lapse of five hundred years. Shall we, then, imagine that it is something great and surprising if the Creator of the universe raises up those who have served him in holiness and in the assurance born of a good faith, when he uses a mere bird to illustrate the greatness of his promise? This is not some sort of whacked-out Christian appropriation of a pagan myth. In St. Clement’s mind, this is no myth at all. This is fact. There is a bird called the phoenix, and it operates in the following way. It is part of God’s glorious creation. 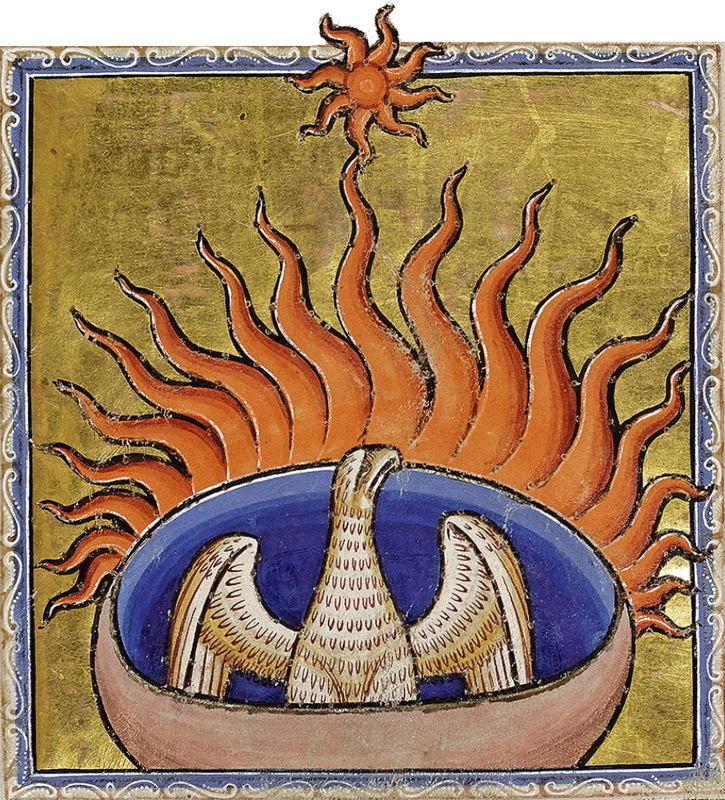 Just as Jesus uses wheat as a symbol of His death and resurrection, so St. Clement uses the phoenix as a type in nature of the Resurrection. Nor is it shocking proof of how quickly the Early Church was Hellenised, how its Hebrew roots were lost and subsumed into pagan culture. Clement was a Jew [I think?]. A Jew with a specific adjective: Hellenistic. The phoenix story shows not how Christians had been Hellenised or paganised, but how Jews living outside of Palestine for generations had become part of the culture around them. Clement knew what he was talking about. He knew this story. Sure, he’d never seen one. I’ve never seen a hippopotamus, either. Apparently, according to footnote 66 on page 56, “Tacitus is more critical toward the legend than Clement (Ann. 6:28).” Other people who wrote about the Phoenix are Hesiod, Herodotus, Ovid, Pliny the Elder. Does the phoenix come under the classification of cryptozoology? Or is that more for things like the brontosauroi in the Congo, and dragons? As a thing to close. There is a story, I think it’s even in Athanasius’ Life of Anthony, about St. Anthony [actually, it’s in Jerome’s Life of Paul of Thebes]. One day he was walking to visit this one fellow monk [Paul of Thebes]. Along the way, he met a hippocentaur (that is a centaur with horse bits rather than bull bits) who was seeking the fellow monk as well. Anthony wept at the knowledge that even this creature out there in the desert was seeking knowledge of salvation. I think that’s how the story goes. I’m not going to look it up.